I received a digital arc of Toil & Trouble from NetGalley. I have really been feeling the witch vibes this Fall from other books like The Casquette Girls so I was looking forward to a whole mess of witchy tales! Unfortunately, I found the stories more messy than interesting. There were a few standouts that I enjoyed, keep reading to find out which ones! The last item promised in the synopsis are stories of witchcraft that are unique and different. I didn’t really find that to be the case. 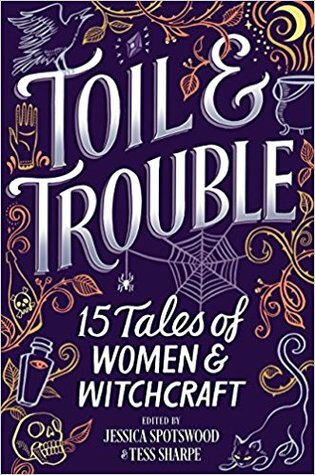 A lot of these witchy tales proceeded exactly how I expected them to with pretty stereotypical characters and plot lines. It was interesting to read about witches from a lot of different time periods. Sometimes, I had a hard time figuring out exactly when a story took place though. There were some short stories I thought suffered from a severe lack of witchyness as well. The first one was especially grating to me and gave a dramatically oversimplified look at a meaningful discussion of modern witchcraft. Not to dwell on the negatives! The stories I really enjoyed were Death in the Sawtooths, and The one who Stayed. Both of these took a look at established covens of witches and their communication with larger, almost cosmic, forces. It’s hard to say much about any story without giving things away, but if you choose to read just a couple stories from Toil & Trouble, these are the two I would recommend. In general, I think the anthology is good but I really wanted each story to have more depth. Most were superficial for my taste, and especially when talking about witchcraft I did have the expectation of more depth. With such short stories, it’s understandable that there can’t be a ton of character development, but I think the premise for some stories could have been stronger. Do you have any witchy recommendations? I would love more to read this Halloween! aah sad that you did not like them so much! I was really excited for this book, but maybe I will try to get it from the library first, before I buy it! Personally I really loved the wicked deep, it’s only a bit about witches, but I really had a witchy atmosphere! I definitely want to read The Wicked Deep! It’s hard to do an anthology length story well I think so I’m not terribly surprised I didn’t love all of them, but it was worth reading to find a few I did!